Popular in the U.S., the UK, Germany, Japan and elsewhere, Thomas celebrated his 60th birthday in 2005, and interest in Thomas the Tank Engine and friends continues to show no signs of slowing down! Planning for a fun, memorable train theme party can be a piece of cake with just a little planning. At least several weeks before the party, start arranging your guest list. Buy invitations at your favorite party supply store, or make your own using Thomas the Tank Engine clipart with headlines reading "All Aboard for Fun!" or "There's a Party Comin' Down the Track!" and be sure to include WHEN, WHERE and RSVP details. On party day, decorate with Thomas the Tank Engine posters and other party ware, and have an activity table ready with Thomas coloring books and crayons. For party games, arrange a variation of "Thomas Says" or organize a fun scavenger hunt by directing kids to find pieces of coal (painted rocks) so they can help Thomas fire up his engine! Meanwhile, keep hungry guests happy with all their favorite finger foods (chicken nuggets, fries, etc.) and get creative with a birthday sheet cake made in the shape of a train engine, frosted in Thomas Tank Engine blue. Thomas the Train Party Birthday Party Ideas - Check out dozens of ideas submitted by readers including tips on activities, food, goodies and party favors for 1-4 year olds. Thomas the Tank Engine Birthday Party Ideas - Listen to parents swap ideas on activities & games, decorations and what to serve, along with pictures of a do-it-yourself Thomas the Tank Engine Cake. Thomas the Train Tank Party Ideas from a Mom! - And a creative one at that - with pictures and illustrations for games & activities, free printables for party favors, and related resources. Thomas the Tank Engine Cake Tutorial - It's all aboard for complete step-by-step instructions and photos. 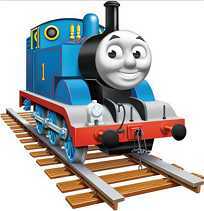 Thomas and Friends - Check out the official U.S. site, featuring printable mini-posters (for decorations), e-cards (for invitations), coloring pages, and ideas for fun activities and games.